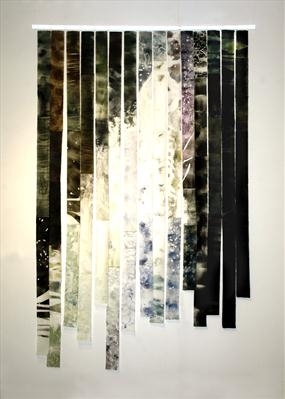 A cascade of running water printed onto fifteen freely hanging strips of Japanese paper suspended from a perspex rod. An original artwork that evokes falling water in the form of strips of japanese paper that move in the breeze of a room. Swirling and bubbling water emerges from darker sections either side of the bright centre. An uplifting and engaging work that would suit a healing or meditation space. This monotype print is unusual in its form and effective in its imagery. It is supplied with a sturdy perspex rod from which the print is suspended.